To be clear, I do not particularly care that Joy Reid has done any of these things. 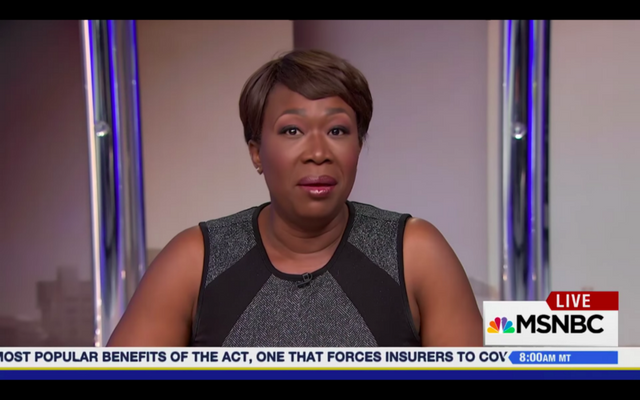 I write about war, nuclear escalations and the sociopathy of US government agencies which kill millions of people; I don't care that Joy Reid is or was a homophobe, and I don't care that she lied to cover it up. The war agendas that MSNBC itself promotes on a daily basis are infinitely worse than either of these things, and if that isn't obvious to you it's because military propaganda has caused you to compartmentalize yourself out of an intellectually honest understanding of what war is. What is interesting to me, however, is the fact that Reid's bosses are protecting her career so adamantly. Both by refusing to fire her, and by steering the conversation into being about her controversial blog posts rather than the fact that she told a spectacular lie in an attempt to cover them up, Reid is being propped up despite this story constantly re-emerging and making new headlines with new embarrassing details, and despite her lack of any discernible talent or redeeming personal characteristics. This tells us something important about what is going on in the world. It is not difficult to find someone to read from a teleprompter for large amounts of money. What absolutely is difficult is finding someone who is willing to deceive and manipulate to advance the agendas of the privileged few day after day. Who else would be willing to spend all day on Twitter smearing everyone to the left of Hillary Clinton while still claiming to stand on the political left? Who else would advance the point-blank lie about "17 intelligence agencies" having declared Russia guilty in US election meddling months after that claim had been famously and virally debunked? Who else would publicly claim that Edward Snowden's NSA leaks did not benefit anyone besides Russia? Who else could oligarchs like Comcast CEO Brian L Roberts, whose company controls MSNBC, count on to consistently advance his agendas? While it's easy to find someone you can count on to advance one particular lie at one particular time, it is difficult to find someone you can be absolutely certain will lie for you day after day, year after year, through election cycles and administration changes and new war agendas and changing political climates. 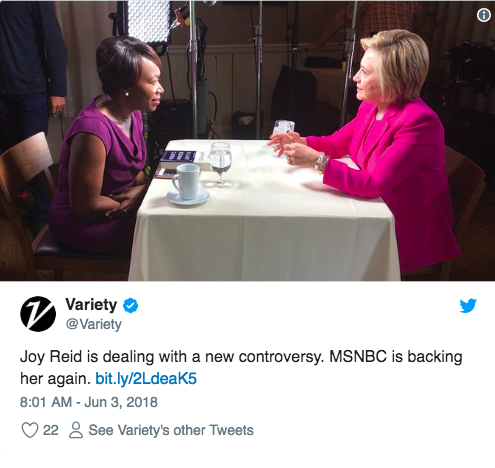 A lot of the people who used to advance perspectives which ran against the grain of the political orthodoxy at MSNBC like Phil Donahue, Ed Schultz and Dylan Ratigan have vanished from the airwaves never to return, while reporters who consistently keep their heads down and toe the line for the Democratic establishment like Chris Hayes, Rachel Maddow and Joy Reid are richly rewarded and encouraged to remain. "Basically, every country creates their own narrative story and, you know, my old job at the State Department was what people used to joke as the ‘chief propagandist’ job," Stengel told the CFR audience. "We haven’t talked about propaganda… I’m not against propaganda. Every country does it, and they have to do it to their own population, and I don’t necessarily think it’s that awful." You can cringe all you like, but he's right. Not about propaganda being a legitimate weapon for an ostensibly free democracy to inflict upon its citizens of course; manipulating the way your citizenry thinks is manipulating the way they vote and organize and what they consent to, and is plainly sociopathic. But he is right that all the shrieking the US does about Russian propaganda applies fully to its own behavior. As we've discussed previously, the only real power in this world is the power to control the public narrative about what is going on. The only reason governments operate the way they operate, the only reason money works the way it works, the only reason power exists where it exists, is that we've all agreed to play along with some made-up mental stories about those things and pretend that they are true and real. The only thing stopping the populace from collectively deciding to change the way money works, from deciding that the assholes on Capitol Hill aren't in charge anymore, or from deciding that every billionaire in America should be butchered like a hog and turned into Slim Jims is the fact that those ideas have not become the dominant narrative. If you can control the stories that the masses tell themselves about what is in their best interests, you control everything. This is why the alliance between Silicon Valley and US intelligence agencies is becoming more and more brazen. This is why Facebook and the NATO propaganda firm Atlantic Council announced that they've formed a partnership weeks after the Atlantic Council published an article explaining why westerners need to be propagandized for their own good. This is why social media corporations are being instructed on the Senate floor that they need to take action to silence sources of rebellion. 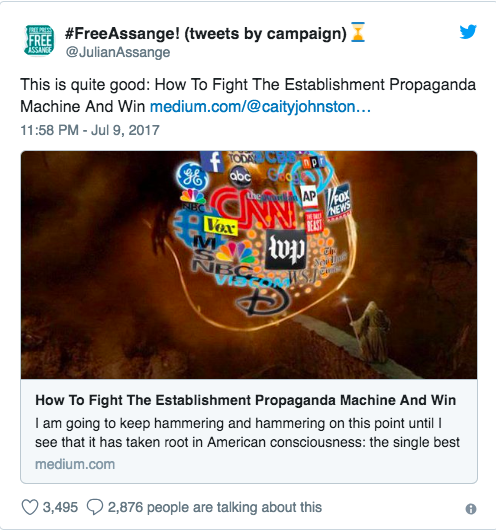 This is why Julian Assange is being aggressively silenced by the western empire. And it is why Joy Reid still has a job. The good news about all this is that we know exactly where our shackles are. Our shackles are made of narrative, and the oligarchs' ability to control it. A populist movement to disrupt establishment narratives and wake people up to what's going on is all it will take to break our rulers' ability to control the way the citizens of the world think and vote. From there we can make our own narratives and create a world which benefits us all and not just a few ruling elites. 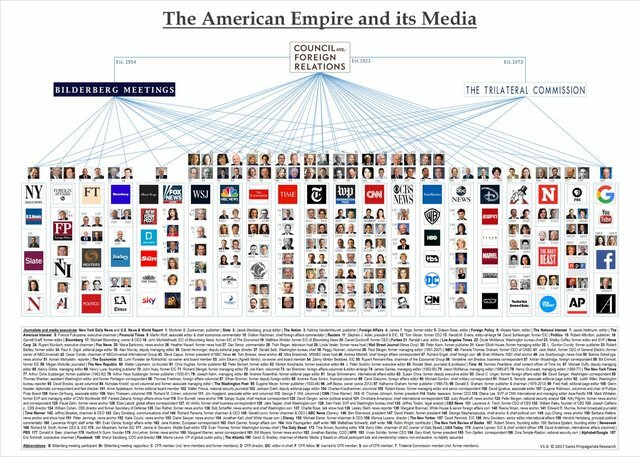 Right now there is a mad rush by those same elites to scale back our ability to network and share information via new media, so one of the most revolutionary things we can do at this time is prevent them from doing so and outpace them in that race. It isn't the west versus Russia. It isn't left versus right. At this time the real conflict in our society is a few ruling elites and their cronies versus humanity's natural impulse to act in a way that is beneficial to humanity. All we need to do is help that impulse flourish, get out of our oligarchy-imposed brain boxes, and build a new world. Very good overview and analysis of what is happening. If nothing else, the election of Trump has served to expose the vandals at the handles behind the curtains. When you look at how Roseanne was cancelled after her tweet and compare it to the treatment of Joy Reid or Samantha Bee, it is obvious the motivations of power. The way the main stream media cheerleads for war is pathetic. 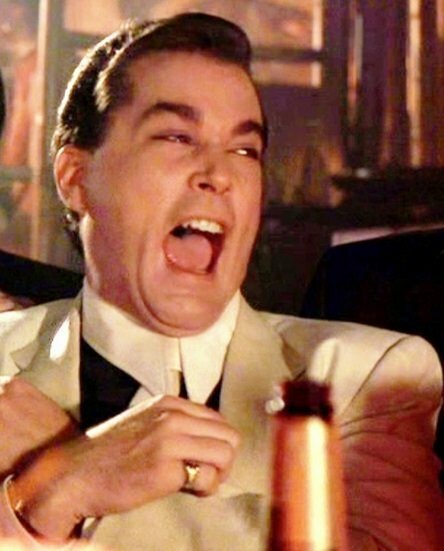 But I guess if you make $30,000 a day like Rachel Maddow, that is enough money to buy whatever luxury or drug you need to cover over the deep hole left by the departure of your integrity and soul. What do you call a socialist who thinks lying is a bad tactic to gain power? If you're implying that Joy Reid and MSNBC are socialists then you are truly too stupid and too easily manipulated by right wing propaganda to bother reading articles by Caitlin. If you want to control the narrative then start by explaining and defining words. Our world is ruled by a kakistocracy of evil ego maniacs who seek to maintain and expand the status quo to the detriment of everything and everyone else. Kakistocracy* = A system of government which is run by the worst, least qualified, or most unscrupulous citizens. Evil = Hurting, oppressing, or killing for fun or for profit. Ego = Me, me, me. Mine, mine, mine. Maniac = A raving or violently insane person; lunatic. Status Quo = Power, profit, and control. Detriment = Loss, damage, disadvantage, or injury. a governing body composed of those considered to be the best or most able people in the state. any class or group considered to be superior, as through education, ability, wealth, or social prestige. Kakistocracy = A system of government which is run by the worst, least qualified, or most unscrupulous citizens. Aristocracy = Government by those considered to be the best or most able people in the state. It should be fairly obvious by now to anyone with more than two brain cells that our planet is ruled by the worst and not by the best people. And the entire human race, animal kingdom, and Mother Earth will continue to suffer to the point of destruction if the worst people remain in power. You're out of line, Caitlin. I understand your feelings towards " the assholes on Capitol Hill". However, hogs didn't hurt anybody; leave them alone! Nice job getting picked up by Zero Hedge!